In part 3 of this corrective history of the Syrian proxy war, we chart ISIS' rapid advance into central Syria and inroads into the Damascus suburbs, as well as Russian intervention and the resulting failure of US regime change plans. See Part 1 here and Part 2 here. Shortly after capturing the city, ISIS released video of its fighters throwing two allegedly gay men from the top of a building, and then stoning them. CBS News cited an eyewitness as claiming that "ISIS militants blared on loudspeakers for men to gather". US planners could have indeed bombed convoys of ISIS fighters moving across the open desert from Raqqa to assault Palmyra, but chose not to. The LA Times reported of this period that “as Islamic State [ISIS] closed in on Palmyra, the U.S.-led aerial coalition that has been pummeling Islamic State in Syria for the past 18 months took no action to prevent the extremists’ advance toward the historic town — which, until then, had remained in the hands of the sorely overstretched Syrian security forces. The U.S. approach in Palmyra contrasted dramatically with the very proactive U.S. bombardment of Kobani during 2014-15 on behalf of U.S.-allied Kurdish militias fending off a furious Islamic State offensive [Emphasis mine].” US planners were willing to come to the aid of their Kurdish allies in northeastern Syria against ISIS, but refused to do the same for residents in Palmyra, as the city had been under Syrian government control. On August 6, 2015 ISIS advanced further toward the Damascus by capturing the town of al-Qaryatain, which lays roughly half way between Palmyra and the Syrian capital. United Press International (UPI) reports that “37 pro-government forces were killed, as were 23 IS militants. The battle began with suicide bombings at checkpoints of the town of about 40,000; the population of the community, a mix of Sunni Muslims and Christians, has been reduced by the flight of refugees. The capture of al-Qaryatain indicates IS [ISIS] can move troops and supplies across central Syria without interference, from Palmyra in the east and southwestward to al-Qaryatain.” CNN cited SOHR as reporting that “The Islamic extremists [ISIS] have abducted more than 200 people, said Rami Abdurrahman, the observatory’s executive director. Up to 500 people are unaccounted for, but Abdurrahman said the observatory has confirmed that at least 230 people have been taken hostage. He said that ISIS militants targeted Christians, some of whom were abducted from the town’s Dar Alyan monastery, as well as people believed to have alliances with the Syrian regime.” To be considered a collaborator or as having “alliances with the regime” by ISIS, it was often enough to simply have a picture of Bashar al-Assad on one’s phone, despite the fact that “lots of people have a picture of Bashar on the phone because it helps them get through checkpoints,” according to one former ISIS captive. ISIS militants then bulldozed the 1,500 year old monastery and its church, while the senior priest, Father Jacques Mouraud, was among the kidnapped. The capture of Qaraytain also allowed ISIS forces to threaten to take control of the strategic M5 highway on month later. The New York Times reported in detail on the meeting, an audio recording of which was leaked, as did the Guardian and CNN. Despite Kerry’s shocking comments, none of these three news outlets mentioned his admission that US planners welcomed the ISIS advance on Damascus, presumably due to requests by US intelligence officials. CNN initially posted the full audio of the leaked tape, but later took it down, claiming in an editor’s note to have done so for the safety of participants in the meeting. 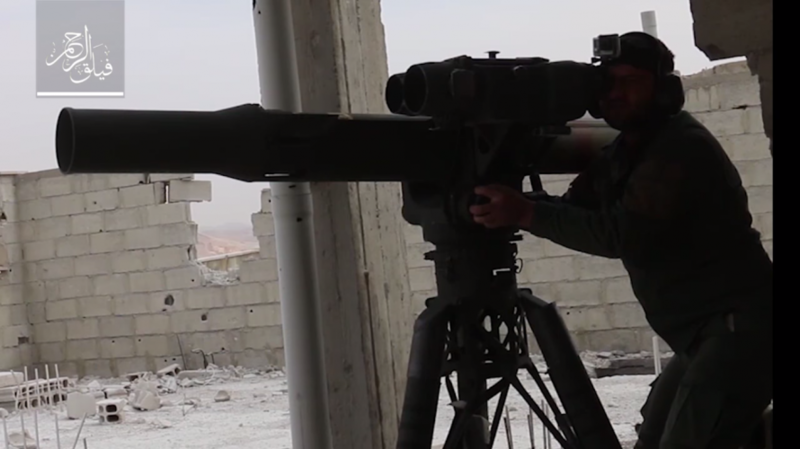 Opposition supporters, including many oddly identifying as socialists, complained bitterly that US planners were not willing to take the step of providing anti-aircraft missiles to the FSA, for the ultimate benefit of al-Qaeda. Author and opposition supporter Leila al-Shami bizarrely suggested the US refusal to provide anti-aircraft missiles to the rebels proves that “The United States support for Free Syrian Army militias on the ground has never really been any more than rhetoric. It’s never really given any serious support to them.” Al-Shami ignores the over $1 billion of weaponry and assistance provided by the CIA to the rebels directly, not to mention the much larger amounts of aid provided by America’s Gulf partners to both the FSA and Salafi rebel groups Ahrar al-Sham and Jaish al-Islam since the start of the Syrian conflict, with US approval. Some opposition supporters expressed to Secretary of State Kerry that they would not be satisfied unless the US military intervened directly on behalf of the rebels to depose Assad, despite the illegality of doing so under international law, and potential that such an intervention could trigger a direct conflict between the US and Russia. Rebel-affiliated media activists tweeting under the guise of the young girl, Bana al-Abed, suggested the US should come to the aid of the al-Qaeda-dominated rebels in Aleppo even at the risk of starting World War III with Russia. US planners welcomed rebel gains in Syria, including by jihadist groups advocating genocide against Syria’s Alawite population such as ISIS and Nusra, because these gains bolstered the broader US goal of toppling the Syrian government, in an effort to weaken its close allies, Iran and Hezbollah. US planners wished to see rebel gains in Syria, in spite of the obviously catastrophic consequences for Syrian civilians that rebel success would bring. US support for the rebels belies the myth of US “inaction” in Syria, and the myth that any US intervention would be for the sake of preventing massacres and even genocide, rather than in support of it. Contrary to most reporting on Syria, which suggests the "civil war" has pitted Syria’s entire Sunni population against its Alawite, Christian, Druze, Shia and other minorities, in fact many Syrian Sunnis support the government and oppose Salafi-Jihadism, the extremist religious ideology undergirding most rebel groups in Syria. Had Damascus and Latakia fallen to the rebels, not only Alawites and Christians, but also pro-government Sunnis and Sunnis opposed to Salafi-Jihadi ideology would have been massacred, not to mention members of Syria’s LGBTQ community. The Russian intervention in Syria then, by all indications, prevented this horrific outcome for Syrians of all ethnic and religious identities, despite the best efforts of US planners to achieve the “catastrophic success” in Syria they had hoped for.